I'm at the part of a project where I have the most doubts. 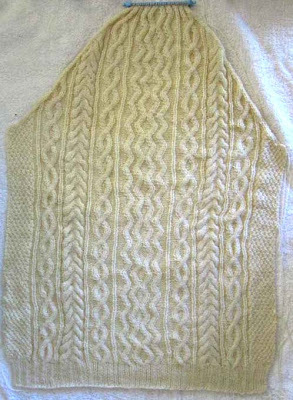 I've soaked the back of the sweater and, of course, it's bigger than when it went into the bath. Will it fit? Did I ruin it by soaking the piece? Will it come back to the size it was on the needles? Will the wool smell go away? Did I choose the right yarn? Are my knitting skills the reason for my doubts? Did I just waste my time and money? Should I continue? Would I dare to give such an item to someone? It's difficult to continue with all these questions going through my head. The back is laid out to the size it's meant to be and, now that the picture has been taken, I'll add pins and let it dry. That should take about 10 minutes here in Colorado since there is only 5% humidity right now! I'll continue with the front and hope for the best. Can I be the only one who goes through all of this when making a sweater, or anything else? It's a wonder I ever want to knit at all. Your knitting is so gorgeous--I'm 100% sure it's going to be perfect. I am in awe of your skills. Of course, with our record high temperatures, you're going to have to take the finished sweater on a trip if you want to wear it. I don't see an end to this crazy weather! 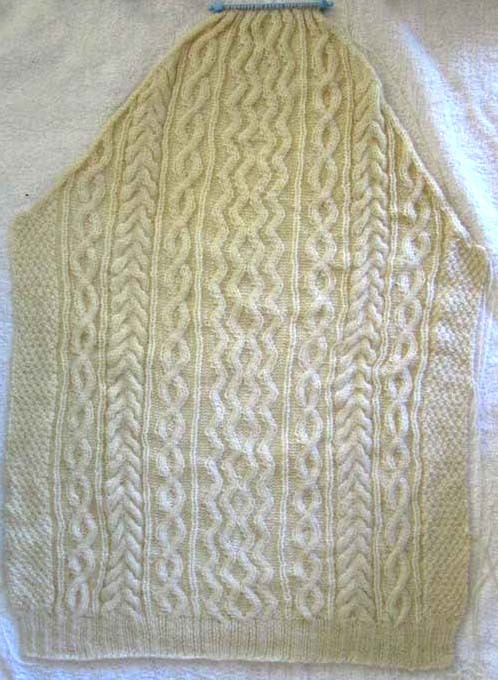 I've got an aran cable sweater I've been having problems with for a few YEARS now. It needs insets and more work. Maybe we should swap! With your skills, though, I'm sure you'll be able to rescue it and make it work.